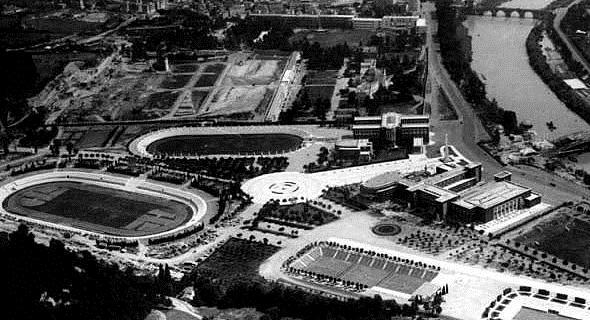 Stadio Olimpico was built to serve as the centrepiece of the Foro Italia sports complex, a project initiated by the regime of Mussolini. Construction started in 1928 and a first tier had been finished in 1932. Works on the second tier were halted though due to the outbreak of the Second World War and were only resumed in December 1950. 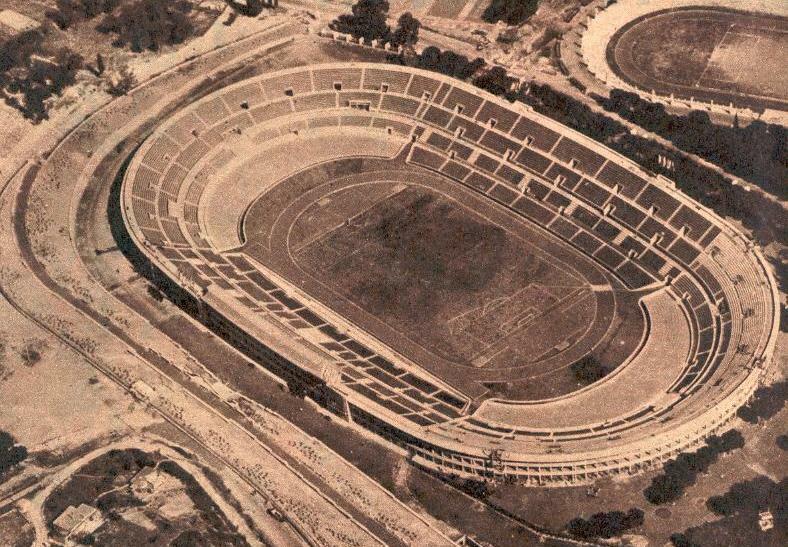 Stadio Olimpico officially opened on the 17th of May 1953 with a match between the national teams of Italy and Hungary. Capacity amounted to 100,000 at that time, which constituted mainly of terraces. Stadio Olimpico served as the centrepiece stadium for the 1960 Olympics, and for this all terraces got converted into seats, resulting in a capacity of 53,000 seats. During the Games, the stadium hosted the opening and closing ceremonies, as well as the athletics competitions. 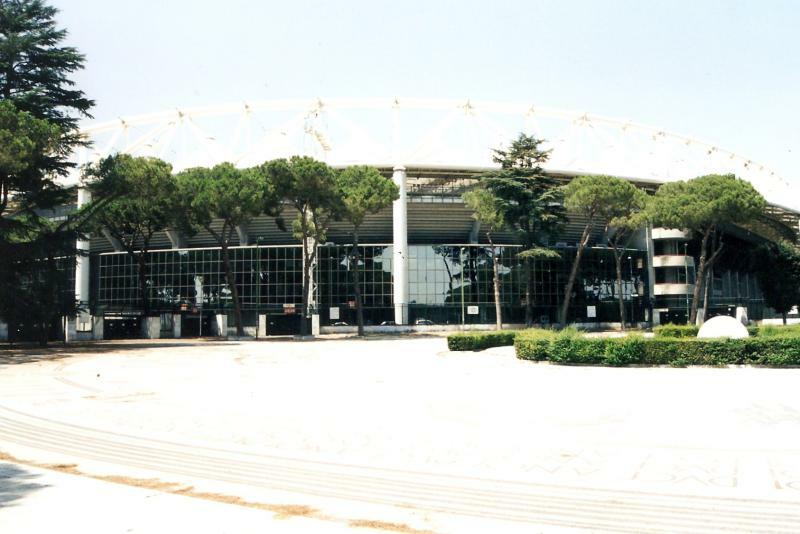 Stadio Olimpico remained largely unchanged until it again was the playing venue of a European Championships, this time the tournament in 1980. It hosted three group matches and the final between West-Germany and Belgium (2-1). In those years, it furthermore hosted twice a European Cup final: the first in 1977 between Liverpool and Borussia Mönchengladbach (3-1) and the second in 1984 between again Liverpool and AS Roma (1-1). 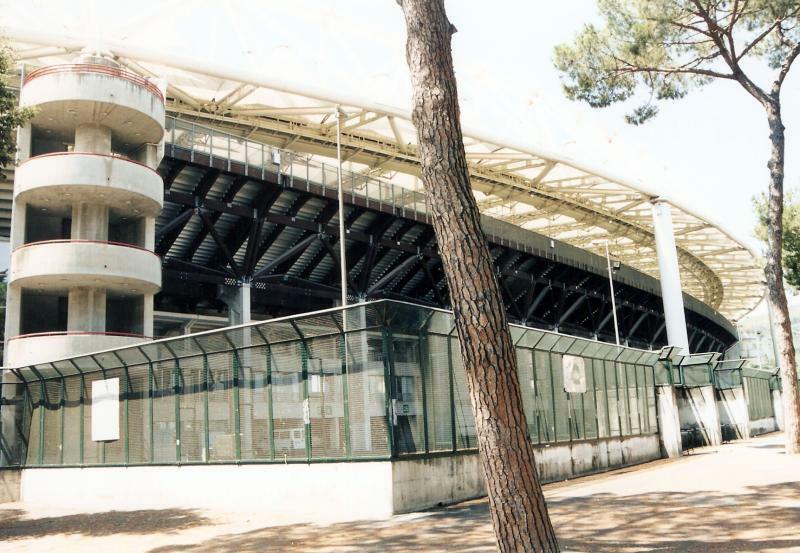 When Italy got awarded the 1990 World Cup, it was clear that the stadium needed a massive renovation. While initial plans only aimed to refurbish the stadium, a few redesigns later an almost complete new stadium had been built. The stands were now much closer to the pitch and the stadium had been equipped with a roof. This resulted in a capacity of 74,000 seats. During the World Cup, Stadio Olimpico hosted all three of Italy’s group matches, Italy’s round of 16 match and quarter-final, and the final between Germany FR and Argentina (1-0). In later years, the stadium hosted two more Champions League finals: the first in 1996 between Juventus and Ajax (1-1) and the second in 2009 between Barcelona and Manchester United (2-0). 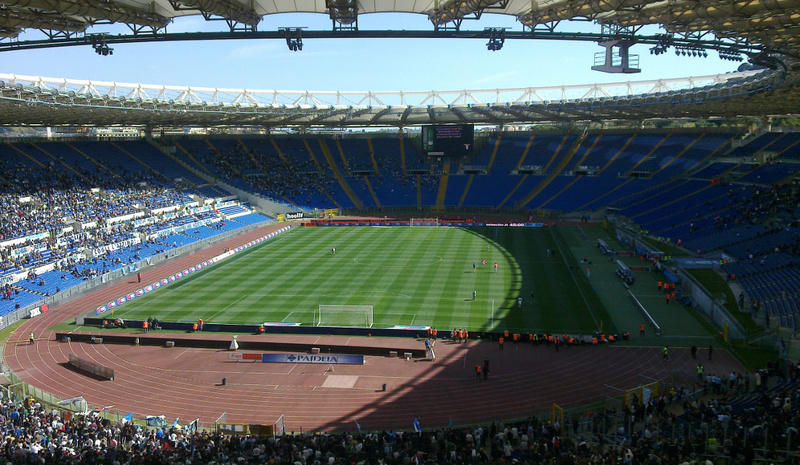 Stadio Olimpico underwent a last refurbishment in 2007 to keep it eligible to host future Champions League finals. This included, among others, the replacement of all seats. 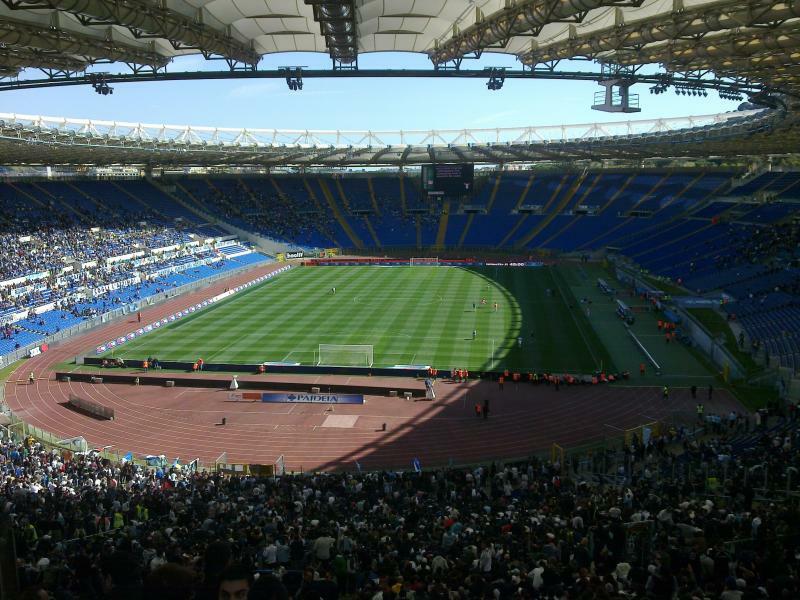 Both AS Roma and Lazio have at times expressed unease at playing in the much-too-large and aged CONI-owned stadium. In the mid 2000s, Lazio had plans to move to a new stadium, but these came to nothing. AS Roma currently have concrete plans to build a new stadium, Stadio della Roma, which will have a capacity of 52,500 seats and they hope to have completed in 2021, though the project have it some setbacks recently. 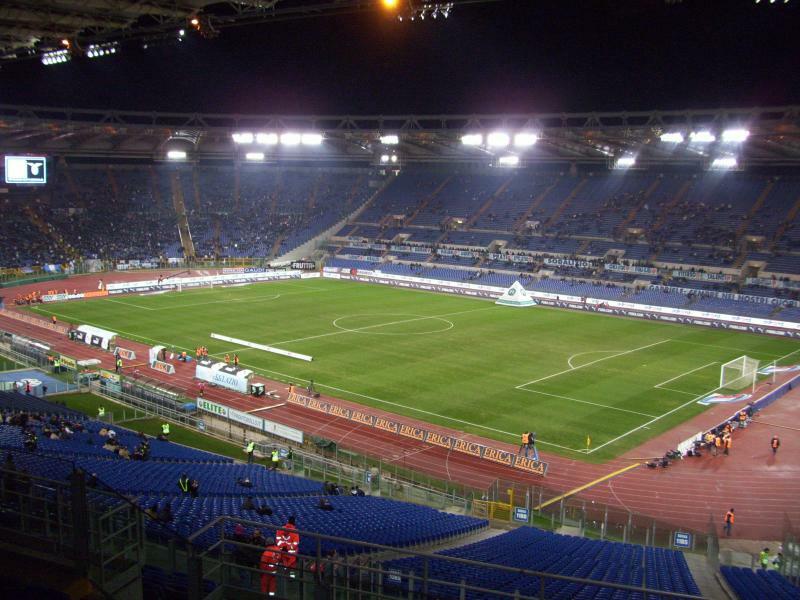 Stadio Olimpico is located towards the north of Rome at about 4 kilometres north of Vatican City. It is situated within the Foro Italico sports complex, which is enclosed by the river Tiber on one side and a nature reserve on the other. To get to the stadium by car, first make your way to the Rome ringroad (G.R.A. ), and then take exit N5 towards Flaminia (on the northern side of the G.R.A.). From there follow the signs to Foro Italico. There are no metro stations close to the stadium, but it is rather easy to reach by tram. Tram 2 passes the stadium on the other side of the river and can be taken from metro stop Flaminio on line A, which is close to the Villa Borghese gardens and Piazza del Popolo. Take the tram in the direction of Mancini and get off at stop Mancini. Alternatively, one can take bus 32 just north of Vatican City at metro stop Ottaviano. Take the bus in the direction of Tor di Quinto and get off at stop Stadio Tennis. Bus 280 can furthermore be caught from the Castel Sant’Angelo or metro Lepanto. Take the bus in the direction of Mancini and get off at stop Stadio Tennis. 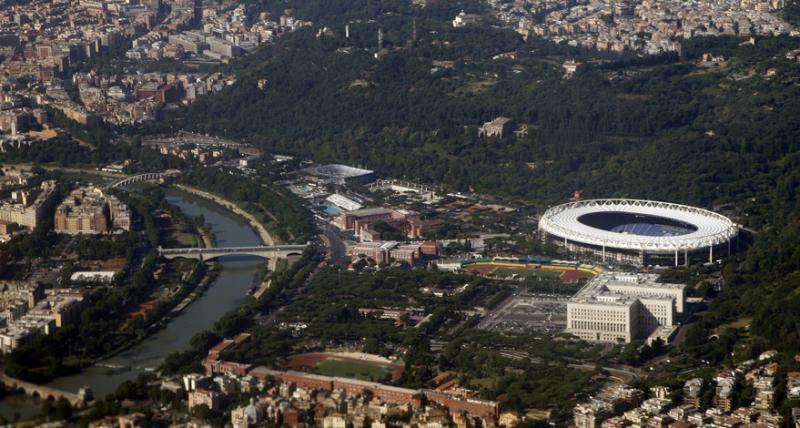 Stadio Olimpico is located in a pleasant area long the river Tiber. It is part of the Foro Italico sports complex that was built by the Italian fascist regime, which means a few architecturally interesting structures. Unfortunately, Stadio Olimpico does not run any stadium tours, which means that on non-matchdays one can only see the stadium from the outside and walk around the complex. 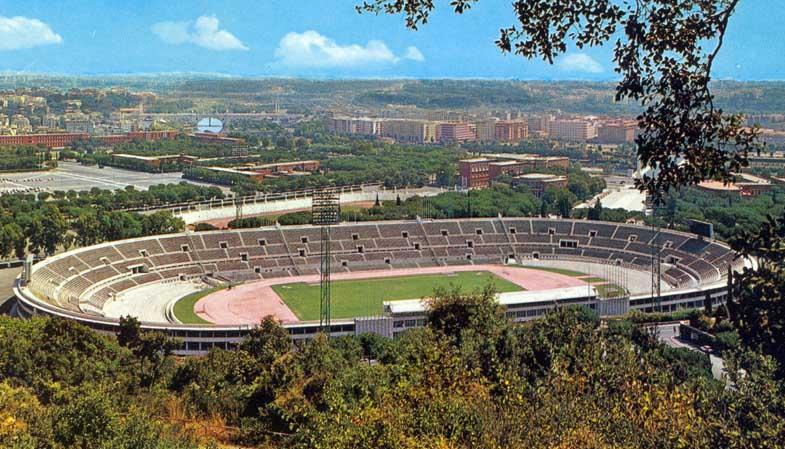 Rome’s other major stadium, Stadio Flaminio lies at walking distance on the other side of the river. There are few options to eat or drink at the Foro Italico complex itself, but the area on the other side of the river is a typical Italian urban neighbourhood, which means that it will not be hard to find an espresso, gelato, or pizza. Of course, the options pale in comparison with Rome’s city centre, and the area furthermore lacks proper nightlife. If you wish to stay close to Stadio Olimpico, there are quite a few hotels around, though it almost always takes at least 10 to 20 minutes to walk to the stadium. Hotels in the area around Stadio Flaminio include Hotel Villa Glori, Best Western Hotel Astrid, Suites Piazza del Popolo, and Face to Face House. These get good reviews, charge between €75 and €125 for a double room, and have the added advantage that the tram to Piazza del Popolo passes right by. Hotels south of the stadium include Hotel Clodio, and a few bed & breakfasts. The options north-east of the stadium include Hotel Farnesina, and the slightly more luxurious River Chateau Hotel. For all hotels near Stadio Olimpico click here. If you wish to stay closer to the centre, but want to strategically locate your hotel toward Stadio Olimpico, then staying close to Piazza del Popolo or near metro stop Ottaviano (generally cheaper) are good options. More hotels in Rome here. Tickets for AS Roma matches can be bought online via Listicket, by phone +39 892 982 (Listicket call centre), in person at one of the AS Roma stores (of which the ones at Piazza Colonna 360 and Via Appia Nuova 130 are most centrally located), or at the Foro Italico Ticket Office near Stadio Olimpico (Viale delle Olimpiadi 61). On the day of the match tickets can be bought at the Foro Italico Ticket Office until kickoff (at the AS Roma stores until a few hours before kickoff). AS Roma currently rarely sell out and even for high-profile matches tickets are generally easily available if bought in advance. AS Roma have divided their home matches into two pricing categories. Tickets for category B matches, the cheapest, range in price from €25.00 for a seat behind the goal to €65.00 for a seat at one of the sides. Tickets for category A matches, the most expensive, cost between €35.00 and €80.00. Tickets for SS Lazio matches can be bought online via Listicket, by phone +39 892 982 (Listicket call centre), in person at one of the Lazio Style 1900 stores, or at one of the Listicket sales points. The store at Via Guglielmo Calderini 66/C is located closest to the Stadio Olimpico and is opened on the day of the match (no ticket sales at the stadium). There are no stores in Rome’s city centre. Just like Roma, Lazio sell out very few matches. Tickets prices can depend on the opponent, but typically range from €20.00 for a seat behind the goal to €80.00 for a seat at the main stand. Tickets prices can be somewhat higher for a few high-profile games. You can find a stadium map here. For more information email info.biglietteria@sslazio.it or call +39 (0) 6 3237333. There are currently no possibilities for stadium tours at Stadio Olimpico. ASRoma.it – Official website of AS Roma. SSLazio.it – Official website of SS Lazio. Turismoroma.it – Official tourism website of the city of Rome. Atac.roma.it – Rome public transport information. Recently attended the Rome vs England Six Nations Rugby match at Stadio Olimpico. Good atmosphere but I have two major complaints. Firstly the eateries (and there are far too few) show pictures of vegetarian food – both sandwiches and pizza. So you queue up for at least 15 minutes (they only open the gates 1 hour before kick off so it’s very busy everywhere), only to be told they don’t have any when you get to the front of the queue. So then you have to search around and are told at every stand that they don’t have anything vegetarian. The main offering was hot dogs or crisps. This is like stepping back in time. Why have pictures and prices if you don’t have the food? Additionally they only serve lager in the whole stadium. No other alcohol – not even wine. This is a RUGBY match for goodness sake and the alcohol choice needs to be extended massively. They need to take a tour of Twickenham on match day and replicate what Twickenham provides – without any issues or trouble whatsoever. If possible, I would appreciate a response – preferably advising that these improvements will be made! Went to Lazio v Sassuolo and bought tickets from the Lazio shop about 10 -12 minutes from the stadium. There was a bit of a queue so don’t leave it too late. There is also a ticket facility within the stadium complex but they did not sell the cheapest tickets in the Curva. Good atmosphere considering the ground was only 1/3 full. There are a few bars / refreshment stands on the river bank as you approach the ground but not much else around that we could see. The stadium is old but still very nice. Fans are crazy. I went to watch Roma- Man City game last December. You can easilly buy tickets from listicket. Id or passport is required to get to the stadium. When picking up tickets from the box office, make sure you take your passport with you. There are no tours or museum either, which is disappointing.